If you’re arriving early you are welcome to leave your bags at the house (from 10:15am). Please let us know prior to your stay if you would like to leave your luggage at the house prior to check-in. The house features keyless locks and self check-in you can be assured so that you can check-in as soon as you arrive after available check-in time (of 2pm). 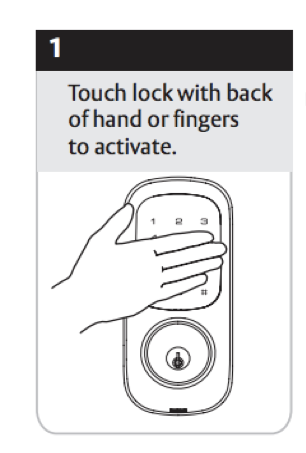 Refer to 'Opening the Front Gate and House Doors' for instructions on how to use the Digital Locks. Check out time is 10am. You are welcome to leave your bags at the house for storage. Please leave the bags outside the kitchen/laundry door (in the undercover courtyard) as your PIN code will expire. Wash dishes / load the dishwasher and turn it on. Don’t worry about making your beds…..all linen is going to be changed. Stripping the beds will help us a lot. Here are some key details to assist you in getting to 94 Highett. The nearest railway station is West Richmond. It is 350 metres away at the end of Highett St. If coming from the city stations you will need to cross over the railway line (there’s an overpass next to the station) and head down Highett St. 94 Highett is on the right hand side on the corner of Highett and Ellis Streets. Go to http://ptv.vic.gov.au/ for public transport details. There are 2 tram lines from the city that pass close by. Trams 48 and 75 travel down Bridge Road. Get off the tram at the Lennox St / Epworth Hospital stop, walk down Lennox St (the same side of the street you get off the tram) and turn right at Highett St. Walk 50m and you’ll be at 94 Highett. Tram 109 travels down Victoria St. Get off at Lennox St. Walk up Lennox St (opposite side to where you get off) to Highett St (about 400m) and turn left into Highett St. Walk 50m to 94 Highett. The Melbourne Airport bus is known as Skybus. Tickets can be purchased at the airport. The Skybus is red and stops in 2 places at the airport (ground level). Just look for the red ticket sales box. Skybus runs 24 hours a day and takes about 20 minutes to get to the city (depending on traffic). Skybus will terminate at Southern Cross station in the city centre. Catch a number 48 or 109 tram directly out on Collins St (corner Collins St and Spencer Streets). The tram will take about 20 minutes or so. Catch an Epping or South Morang train and get off at West Richmond. It will take about 10 minutes. To use the Trams or Trains in Melbourne you will need a Myki card. Myki is the cashless ticketing system in Melbourne. Myki cards can be purchased at Southern Cross ticket windows (and many other shops like 7/11). All Melbourne taxis are yellow. Every taxi should be able to find Highett St without any problems. If the taxi driver asks where in Highett St you want to go, tell them the house is close to Epworth hospital. If there are more than two people in your party it will be cheaper to catch a taxi from the airport to 94 Highett. Depending on when you land you might have a bit of a wait. To avoid waiting, and for a bit of luxury we recommend Skylimo. You need to pre-book and they will meet you at the airport when your plane arrives and drive you directly to 94 Highett. We have used them hundreds of times and they are very reliable. The price is a little higher than a taxi but the convenience (and luxury) is worth it. A driver will be waiting in the arrivals hall (near baggage claim for domestic flights and outside customs for international flights) holding a sign with your name on it. Go to www.skylimo.com.au to book. You can book a one way or return trip with Skylimo. Uber is available throughout Melbourne including to and from the airport. Head for Richmond and you’ll end up somewhere on Bridge Road, Victoria St, Punt Road or Swan St. 94 Highett is almost right in the middle of the 4 main Richmond roads being Punt Road, Bridge Rd, Church St and Victoria St. 94 Highett has 2 off street parking spots and 1 on street spots. Be careful not to park on Richmond streets without using the parking permit. Parking inspectors are always lurking. Also be careful of the no parking times outside 94 Highett on a Tuesday and Wednesday morning. Refer to the street signs that detail when parking is not allowed (due to street sweeping). 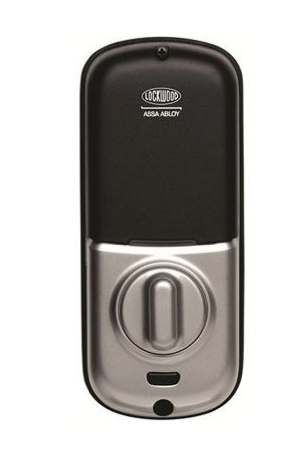 94 Highett features keyless locks so you don’t need keys. There is a lock on the front gate as well as the house doors. The following explains how to use these. The gate will automatically lock when closed. Note: the code must be entered to enter and exit the property. For added security, please keep the gate closed and locked at all times. Each external house door has a lock as shown. Before your stay we will provide you with your PIN number to open the doors. This PIN number will be valid for the duration of your stay. 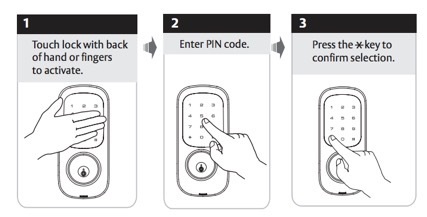 Follow the three step instructions below to open the door. If you experience problems and cannot open the door please contact us by phone as we can open the doors remotely. Turn the knob to the right to lock the door. Remote controls are available for each air conditioner. Please switch off air conditioners when rooms are not in use. Press the Power button. If the air conditioner does not beep and front vent on the air conditioner does not open press the Power button again. Set the desired temperature using the Up and Down arrows. To change the fan speed slide down the bottom flap of the remote and press the top right hand button to change the fan speed. Note: All air conditioners must operate in the same mode, i.e., they must all run in either heating or cooling mode. If you find that one of the units will not switch on (or turns off soon after being turned on) it will be due to another unit somewhere in the house running in the opposite mode. To use the BBQ, first turn on the gas cylinder. A spare gas cylinder is available if the gas runs out. Please exercise caution when changing the gas cylinder. If you are unsure how to do this, please contact us (refer Contact). Please thoroughly clean the BBQ (hotplates and BBQ) after use. A cleaning fee will be charged if the BBQ is left in a dirty state. Remember to turn off the gas cylinder when you have finished. Please let us know if any items break or fail so we can replace or repair them for the next guests. Damage to items beyond normal wear and tear or breakage of items beyond minor accidents such as a broken glass etc. will result in your security / damage deposit being held to pay for damaged items. Please refer to the Terms and Conditions of hire for further information. Candles, Sparklers or any flame are strictly prohibited at all times. CANDLES, FIRE AND NAKED FLAME MUST NOT BE USED ANYWHERE AT ANY TIME FOR ANY REASON. Check in is from 2pm. If you’re arriving early you are welcome to leave your bags at the house (from 10:15am) and if the house is ready you are welcome to check in early. Please let us know prior to your stay if you would like to leave your luggage at the house prior to check-in. Check out time is 10am. If you would like to leave your bags at the house before you leave, please leave them in the covered courtyard outside the kitchen door. Note: Do not leave bags in the house after check-out as your lock PIN code will expire and not let you back into the house. A Nespresso coffee machine is available for your use. Please use only Nespresso compatible pods in the machine. Instructions on using the machine and milk frother are next to the machine. There are also plungers and an Italian stove top coffee maker available. No confetti (or rice or similar), glitter, feathers or similar to be used anywhere in the property (indoors or outdoors). No pins, tape, nails, staples etc. in walls, furniture or fixtures. No candles may be lit at any time. The fireplaces are ornamental only and must not be lit. Foxtel (cable tv) is available on the lounge room TV (not bedroom TV’s). To watch Foxtel, press the SmartHub (orange) button on the remote control and select Foxtel Play from the menu. Use the arrow keys on the remote control to navigate the Foxtel menus and the ok button to select an option. Note: Foxtel runs through the internet connection. Heavy use of the internet may cause Foxtel to fail. Please do not move any furniture in the house. The cost to move furniture back to its original position will be deducted from your security bond. The kitchen bin is in the cupboard under the sink. Bins are also located in each bathroom. The house bins are emptied into the green wheelie bins in the back garage. The green lid wheelie bin is for non recycle items. Do not dump unbagged items into the green lid wheelie bin. All garbage must be bagged. Garbage bags are in cupboard under the kitchen sink. The yellow lid wheelie bin is for recyclable items (bottles, paper, cardboard etc.). Bins are collected every Tuesday morning. If the bins are not located in the rear courtyard they will be located on the side street (Ellis St). Please bring them in through the garage (if they have been emptied). Hydronic central heating is installed throughout the main house. The thermostat located in the front hall is set to maintain a minimum temperature in the house. Please do not tamper with the thermostat. Refer to ‘Air Conditioner’ for instructions on how to set the temperature in each room. There is plenty of hot water for showers. If both spa baths are used the hot water tank may be drained. Please allow up to 60 minutes to heat more water. An ice machine (and cold water) dispenser is located in the kitchen next to the Refrigerator. Ice is dispensed by holding a glass against the ice dispenser button at the middle front of the machine. The cold water outlet is to the right of the ice dispenser. Press the ‘Water’ button on the control panel to dispense cold water. Press the On/Off button to start making ice. The ice machine is fast and will make ice cubes within 15 minutes. If the Tap symbol illuminates on the front panel then the machine requires refilling with water. Free internet is available at 94 Highett. 94 Highett features a fully equipped kitchen with refrigerator, oven, microwave, cooktop and dishwasher. All crockery, cutlery and glassware is provided. There is also a selection of kitchen food basics (spices etc.) to get you started. You just need to buy or bring fresh food with you. Please ensure all crockery, cutlery, glassware, pots and pans are thoroughly cleaned before you depart. Please use Gumption paste (under the kitchen sink) to thoroughly clean pots and pans. Laundry facilities are available for your use. Please use the smaller white washing machine. The other machine is for staff use only and must not be used. Liquid washing detergent and fabric softener is provided. Use a capful of liquid detergent and a full capful of fabric conditioner per load. A clothesline is available in the garage closest to the house. Pull the bar out from the clothesline and attach it to the bracket on the opposite wall. Lock the clothesline into place by turning the handle on the main clothesline unit. A clothes dryer is available in the laundry. Follow the instructions below to use the clothes dryers in the laundry. Set the dial to 'Ready to Wear Plus' or 'Delicates'. Both of these are sensor cycles and the dryer will automatically turn off when your clothes are dry. Bridge/roof deck light – the switch is located on next to the door in the upstairs hall. Complimentary makeup removers are provided in each bathroom. Please do not use towels or linen to remove / wipe makeup, fake tan, hair dye etc. The replacement of soiled or stained towels and linen will be funded from your security / damage bond. The Sony music player on the kitchen bench plays CD’s as well as connects iPod and phones using the USB port. There are hundreds of CD’s available for your use in the CD rack in the dining room. Please replace all CD’s into their covers and place back in the CD rack after use. Netflix is available on the lounge room TV and Master bedroom TV’s (downstairs and upstairs master). To watch Netflix, press the SmartHub button on the remote control and select Netflix from the menu. Navigate the Netflix menus and enjoy. Note: Netflix runs through the internet connection. Heavy use of the internet may cause Netflix to fail. Whilst 94 Highett is in the middle of all the action, it is a residential area and our neighbours deserve their quiet enjoyment. Please be respectful and ensure you keep noise, particularly outdoors, to a minimum. Two off street parking spaces are available in the garages. Use the remote control to open the garage doors. The top left button opens the back garage, the top right button the front garage. Please be aware that the control pads are sensitive so please don’t place the remote controls in hand bags or pockets as you may accidentally open the garages. There is an additional parking permit for on-street parking that is available on request. This is useful if you have 3 cars or a large vehicle that is difficult to get into the garage. The permit must be hung from the rear vision mirror, facing forward. Parking inspectors are tough and will fine you if the permit is not hung from the rear vision mirror. The permit allows you to parking in any resident only permit zone within 2 streets of 94 Highett. Please be aware that the permit zones on Highett St do not operate between 9am and 10 am on Tuesday and Wednesday mornings for alternate sides of the road (to allow for street sweeping). Refer to the street signs for which side of the road is closed for each day. Again parking inspectors are tough and you will be fined if you park in the permit zones on Tuesday or Wednesday (between 9 and 10am). Note: the parking permits are expensive and extremely difficult to replace if lost. If you misplace or take the permit with you when you leave, you will lose your security bond. Melbourne’s electricity supply is very reliable. In the event that there is a power outage torch lighting is available. If the power is overloaded at any stage the circuit breaker will trip and turn some of the power off. The power supply is located on the outside of the house on the Ellis St side (next to the side gate). To restore power push any switches in the down position to the up position. 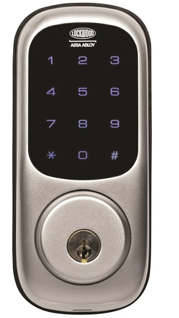 94 Highett features keyless locks. Your PIN number is valid for the duration of your stay. Protect it like a key. Do not tamper or cover security devices such as digital door locks or security cameras. Tampering or covering security cameras will result in cancellation of your stay and eviction without refund. Smoking in the house is strictly prohibited. Smoking in the house will attract a $300 cleaning and deodorizing fee. Smoking is permitted in the outdoor areas (front porch, courtyard or roof top deck). Please ensure cigarette buts are disposed of correctly and not thrown in the garden (including pot plants) or on the street. Cleaning of cigarette butts thrown in the garden will be deducted from your bond. The house features hard wired smoke alarms and emergency lighting. In the event of fire, the alarm will sound throughout the house (including the studio) and emergency lighting will illuminate. The smoke alarms are not connected to the fire department. Ring 000 and provide details of the fire. Assist any person in immediate danger (only if safe to do so). If safe to do so, close doors to minimise spread of the fire. Attack the fire only if safe to do so. A fire extinguisher is located on the courtyard wall outside the kitchen. Assist with the evacuation of mobility impaired occupants. Move to the evacuation assembly point in the park across the road from 94 Highett and stay there until the All Clear has been given. Follow closely the instructions of emergency services personnel. Note: the smoke alarms can be activated by steam. The smoke alarm in the upstairs hall can be set off if there is excess steam from the bathroom or spa. Please ensure the bathroom fan is switched on to avoid the alarm being triggered. In the event of a false alarm (e.g., burnt toast or steam from the upstairs bathroom) the smoke alarms will reset themselves after the cause of the activation has been cleared. Coles supermarket is located at Richmond central on Church Street. This is a large traditional supermarket where you will be able to purchase a wide variety of food and groceries. Turn right from the front gate at 94 Highett and walk 350 metres to Church St (intersection with traffic lights). Turn right and walk 300 metres. The Coles supermarket is located in the Richmond Central Shopping Centre. Parking is available behind the supermarket. Coles is usually open 6am to midnight. Woolworths and Aldi supermarkets are located together on Victoria Street. Woolworths is a large supermarket and is probably the best in the area. Turn left from the front gate at 94 Highett and walk 50 metres to Lennox St. Turn right at Lennox St and walk 400 metres down Lennox St to Victoria St. Woolworths and Aldi are located in a shopping mall on the corner of Victoria and Lennox St. Parking is available with the entrance off Lennox St. If you drive to Woolworths you cannot drive down Lennox St as it is one way. You need to drive down to Church St (opposite direction), turn left and Church St, drive 600 metres then turn left at Victoria St. Drive 400 metres then turn left at Lennox St and into Woolworths car park. Woolworths is usually open 7am to 10pm. There are many bakeries, fruit and vegetable shops, delis and bottle shops (off licence) around 94 Highett. The closest bottle shop is on Church St about 100 metres from the corner of Highett and Church streets. There are many Asian grocers, bakeries and supermarkets along Victoria Street. The two master bedrooms have Samsung Smart TV’s. These TV’s allow you use many internet functions such as surfing the internet and running many applications. Press the SmartHub icon using the remote control or keyboard in your room. Select the WebBrowser icon and you can surf the internet from the TV. Note: the lounge room TV uses a different remote control. The bedroom remotes and keyboards will not work with the lounge room TV. We supply toiletries such as body wash, shampoo, conditioner and moisturizer. We also supply toilet paper and make up remover pads. Please use makeup remover pads rather than towels. Make up soiled towels that are permanently stained will result in your damage deposit being used to replace the damaged towels or linen. We have a large selection of Melbourne and Victorian tourism brochures available for your use. They are located on a stand in the dining room. 94 Highett features an automatic gardening watering system for the garden. You may notice run off water in the courtyard, roof deck and front garden. Please be careful not to slip. Please do not touch the watering system controls (taps or control panels).